Nigerians on every first day of the month of October annually, celebrate their Independence from British colonialists. It is a day officially set aside to commemorate the official hand over of the British contrapted country to the Northern Hausa-Fulani Islamic caliphates which took place in October 1, 1960 according to history, under the deceit of Independence. And eversince then till date, it has been a day especially hallowed throughout Nigeria with public holidays ostensibly declared by the government. Every first day of the month of October, people of different classes converge in various places to celebrate. Even school children are not left out, adorning themselves with Green White Green colours signifying their love for their country. However and very recently too, the story associated with the love for Nigeria by the people has gone sour thereby grossly diminishing the very essence of the event with reference to Biafraland. BUT WHY THE LOST OF INTEREST IN THIS CELEBRATION? It is pertinent to state here that the contraption called Nigeria was birthed through inorganic and unnatural processes. In the year 1914, a British soldier named Fredrick Lugard sojourned in West Africa and discovered the vast population of blacks spotted in various settlements. He realised that while some were wealthy in manpower and resources, others were apparently poor, lazy and unadventurous. They were simultaneously incoherent, culturally divergent and religiously incompatible. But despite all these conspicuous and monumental differences, Fredrick Lugard in collaboration with the British Government forged ahead forcefully with their amalgamation agenda for the Northern and Southern protectorates which eventually culminated into the present day entity called Nigeria. And true to the seemingly endless deceptive, manipulative and enslavement policies at the centre against some sections of the country, Nigeria has remained an unworkable formula and a giant fraud known to humanity. This was principally orchestrated not to better our lives as a people but to service the egocentric interests of the British who is bent on perpetually emasculating and impoverishing the blackman. It is therefore necessary at this point to notify the world once again that since the creation of Nigeria, there has never been any known peace, unity and progress The Biafran people have over the years, been subjected to all manner of dangerous exterminating policies of the Nigerian government. 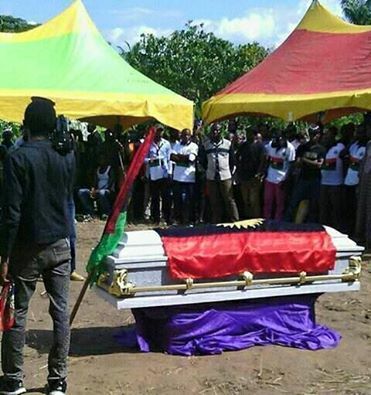 Biafrans have continually and variously been sacrificed on the altar of delusional unity (One - Nigeria). This unholy union of very distinct divergent people groups has brought unimaginable pain, penury, misery and death to the Biafran people. The Hausa-Fulani Islamic agenda foistered on the people is steadily being driven to completely conquer and possibly wipe out Biafrans who have remained their sworn enemies right from 1945 when many Biafrans were massacred. Between 1967-1970, a record of millions of Biafrans were killed in the genocidal war of attrition carried out by the Nigerian military and her foreign allies. Boko Haram terrorists and their fellow Islamic vampires called Fulani herdsmen have unrelentlessly carried out large scales of unhindered killings across the country up till date. And anybody who dare raises questions on the persistent official alienation of the Biafran people is termed an enemy that must be eliminated. The Onitsha massacre of 30th of August 2015, the Port Harcourt massacre of 20th January 2016, the Aba massacre of 9th February of 2016, the Nkpo pogrom of 30th May 2016 and most recently, the Umuahia massacre of 2017 of Biafrans just to mention this few were all carried out against Indigenous People who carried no arms, peaceful and non-violent by the Nigeria government's sponsored Hausa-Fulani Islamic military. Nigeria has hauled uncountable number of Biafrans: youths, men and women into prisons times and times again without any recourse to the law, the disgusting inhuman conditions inherent in those environments notwithstanding. Nigeria is a country that sees self-determination struggle as a crime and a call for Referendum as terrorism. What a shame? In view of this catalogue of unrelenting Islamic vampirism and jihadistic onslaught being visited on Biafrans, is it then justifiable for any sane mortal to consider participating in any form of celebration? As Israelites would say: "How can I sing the LORD'S song in a strange land"? 1st of October is officially declared every year in Nigeria for the joyful commemoration of jaundiced Independence but for us as Indigenous People Of Biafra (IPOB) worldwide, that date remains an official day throughout Biafraland for the mourning of all our Fallen Heroes. 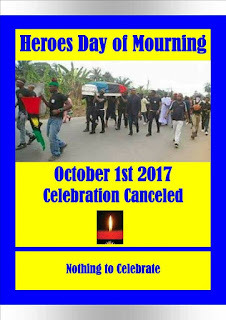 There is absolutely no hope in Nigeria and Biafrans are enjoined to committedly demonstrate how much they have rejected Nigeria as the Green - White - Green flag and decorations Nigeria is associated with, will not only be made scarce in Biafraland but will completely be non-existent on the 1st day of October and throughout the moments the event is slated to last. Conclusively, I want to ask: What does this satanic contraption called Nigeria really mean to Biafrans? One Nigerianism to Biafrans means perpetual enslavement, marginalisation, deprivation, suppression, political disenfranchisement, economic emasculation, Islamisation, misery and death. Let him that reads, read with understanding!